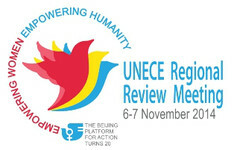 The Beijing+20 Regional Review Meeting was held on 6 – 7 November 2014 at the Palais des Nations in Geneva. The meeting addressed key areas of progress and challenges in the implementation of the Beijing Platform for Action in the UNECE member States. It focused on such issues as long-term trends in gender equality and the empowerment of women, women’s representation and leadership in decision-making, eliminating violence against women, anti-discriminatory legislation and gender justice. As it marked the 20-year anniversary of the adoption of the Beijing Declaration and Platform for Action, the meeting was an opportunity to highlight key achievements and setbacks over the last two decades and discuss how to strengthen gender equality in the post-2015 development agenda. Speaking at the opening session alongside UN Women’s Executive Director Phumzile Mlambo-Ngcuka and HRH Crown Princess Mary of Denmark, UNECE Executive Secretary Christian Friis Bach called for all stakeholders to accelerate their efforts to empower women and achieve gender equality, so that all women can live in safety and with dignity. It was widely agreed at the Meeting that all stakeholders have crucial roles to play in the ongoing implementation of the Beijing Platform for Action. Report: Food and Agriculture Organization of the United Nations (FAO) "Rural Women in Eastern Europe and Central Asia"
Here are the final conclusions of the Beijing+20 Regional Review Meeting, (see annex I of the meeting report).